About a week ago Luís Vasquez from Portugal notified me about an item for sale on Ebay which could possibly be the Street Rod Car Data Disks. As I found out those were original disks of Street Rod itself. However, the person selling those disks also had another item for sale. 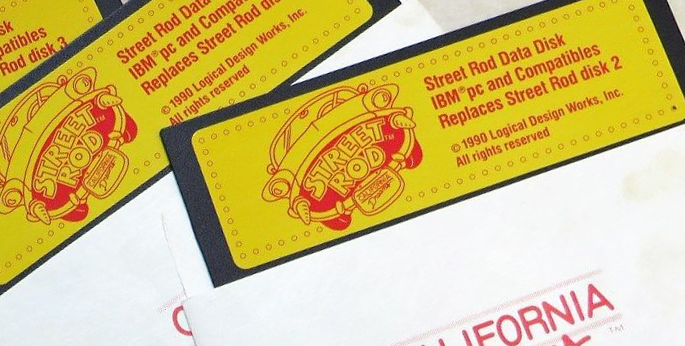 After a close look I got convinced those were indeed the Street Rod Data Disks I was looking for since January 2013. Last night I was able to buy those disks and I hope to receive them within 2 or 3 weeks. Shipment won’t be a problem, however Dutch customs will hold the package for an indefinite amount of time to determine import duty. The next challenge will be to get the contents from the disks. As floppy disks can degrade over time it remains to be seen if we can play Street Rod with different cars at all. The seller also notified me about the disks being a replacement set for the original cars. It’s not an add-on set as I suspected, it’s a version of Street Rod with the original cars replaced by different ones. Will you make the content available if you can retrieve the data? This would be a spectacular find if you got additional cars (to swap with the existing cars). Yes, if can get the data off those disks it will be made available in the downloads section.